MotherToBaby "Text Counseling" Now Available! Text4baby offers pregnant women and new moms the health information and tips they need most! The Allure of Alcohol - Why do Women Continue to Drink during Pregnancy? Women can experience depression and anxiety during pregnancy and after birth - get help. Prefrontal cortical responses in children with prenatal alcohol-related neurodevelopmental impairment. A functional near-infrared spectroscopy study. Many people are aware that excessive drinkinga can be harmful to the liver and other vital organs; however, there is another, less obvious, body system that is vulnerable to the negative effects of alcohol: the immune system. Because of alcohol’s effects on the immune system, people who drink to excess are at increased risk of contracting infectious diseases, may have more complications after surgery, and often take longer to recover from illness, compared with those who drink at lower levels. Disruptions in immune system function also contribute to organ damage associated with alcohol consumption. This Alcohol Alert reviews the normal workings of the immune system and explores how alcohol interferes with these functions. aDefinitions of excessive, heavy, and binge drinking may vary among the original research articles cited in this Alert. Please refer to original source for details. The National Institute on Alcohol Abuse and Alcoholism (NIAAA) defines low-risk drinking as no more than 3 drinks on any single day and no more than 7 drinks per week for women, and no more than 4 drinks on any single day and no more than 14 drinks per week for men. Drinking above this level increases the risk for alcohol use disorder. NIAAA defines binge drinking as a pattern of drinking that brings blood alcohol concentration levels to 0.08 g/dL. This typically occurs after 4 drinks for women and 5 drinks for men—in about 2 hours. The Substance Abuse and Mental Health Services Administration defines heavy drinking as drinking 5 or more drinks on the same occasion on each of 5 or more days in the past 30 days. Our bodies are constantly exposed to a barrage of microbes, including viruses, bacteria, and fungi. Some of these are necessary for our well-being, such as the bacteria that live in the intestine and help with digestion; others can cause illness or have other toxic effects. The immune system is the body’s defense against infectious disease, helping to distinguish, for example, between “good” and “bad” bacteria and eliminating harmful organisms (so-called pathogens) from the body. Equally important, however, is the immune system’s ability to detect tissue damage and orchestrate the body’s response, including removing damaged tissue and assisting in subsequent tissue repair and regeneration. To perform all of these functions, the immune system relies on an elaborate network of highly specialized cells that interact in a tightly orchestrated way. Some of these defense and damage-response networks are in place at birth; this is called our innate immunity. Other parts of the immune system develop throughout life, allowing the body to “learn” and adapt whenever it encounters a new pathogen; this is called our adaptive immunity. The innate immune system includes physical barriers, such as the skin, that prevent organisms from entering the body directly; physiological barriers, such as enzymes in the stomach and intestines, that destroy many pathogens and toxins that enter the body with food; and specialized immune cells that work throughout the body to combat infection and disease. The innate immune system mounts the first swift response to pathogens or tissue damage, seeking to attack and destroy invaders or eliminate damaged cells. An example of innate immune system activation is the initial inflammation, often characterized by redness and pain, that occurs in response to an infection or infection-free tissue injury. The adaptive immune system, on the other hand, mounts a longer-lasting response, involving numerous types of immune cells and molecules. It not only protects the body from pathogens that bypass the defenses of the innate immune system, but it “remembers” each particular pathogen it encounters. Therefore, if the pathogen should invade a second time, the body can launch an even speedier and more targeted counterattack. Highly specialized immune cells, including white blood cells, are key players in innate and adaptive immunity, particularly cells called monocytes and macrophages, neutrophils, natural killer (NK) cells, dendritic cells, T cells, and B cells. 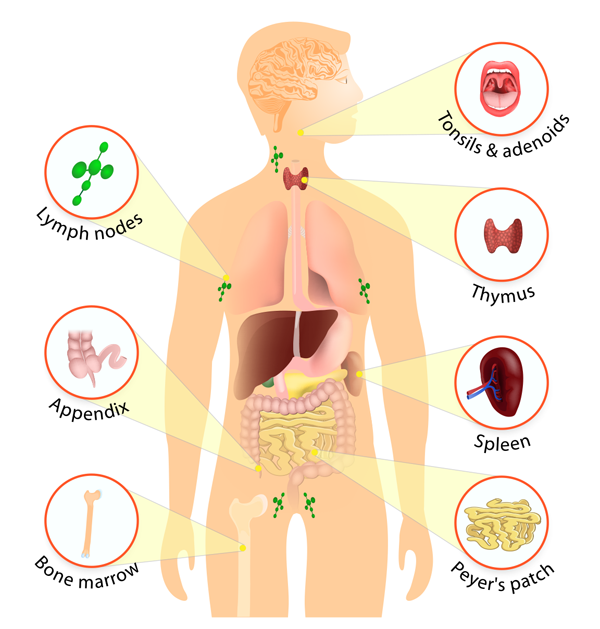 These cells circulate in the bloodstream and also reside in primary and secondary lymphoid organs, including the thymus, bone marrow, and lymph nodes and spleen, as well as in organs like the liver and brain (see figure). This widespread distribution allows the body to respond to not only general infections but also localized infections and tissue injury. To optimally exert their effects, the immune cells communicate with each other and with various other cells in the body through signaling molecules called cytokines, which trigger specific immune responses. In addition, B cells produce proteins called antibodies or immunoglobulins, which recognize foreign molecules and bind to them, thus marking them for destruction. Considering the important roles of the immune system, and the many players and interactions that contribute to its proper functioning, it is not surprising that disruptions to the system—for example, those related to alcohol consumption—can adversely affect health. Figure Distribution of immune cells in the body. Immune cells circulate in the bloodstream, reside in the tissues depicted here—which have a dedicated role in immune function—and also reside in organs such as the brain, liver, lungs, and skin. Alcohol also adversely affects the immune system through its effect on the liver. An important component of the innate immune system, the liver produces a wide variety of antibacterial proteins.3 If the liver is severely damaged by alcohol, it is less capable of producing these proteins, thereby increasing our susceptibility to bacterial infection. Indeed, bacterial infection is one of the most common complications of severe alcoholic hepatitis and alcoholic cirrhosis. In addition to its direct effects on the immune system, alcohol can have an indirect impact on immunity through its actions in the stomach and intestines (GI tract). The GI tract is one of the first parts of the body to come into contact with alcohol and, as a result, bears the brunt of alcohol’s harmful effects. In addition to those described above, a variety of other illnesses have been linked to the effects of alcohol on the immune system. Several of these adverse health consequences are discussed below. bAlcohol use disorder (AUD) is a diagnostic term that refers to clinically and functionally significant health, psychological, social, or legal problems caused by recurrent alcohol use. Though human research in this area is limited, studies using postmortem human brains have found that immune factors are increased in the brains of people who had alcohol use disorder. These studies have also found that the expression in the brain of certain immune factors is correlated with lifetime alcohol consumption. In addition, immune molecules, such as inflammatory cytokines, produced when bacteria leak from the gut into the bloodstream, can be transported to the brain where they produce a long-lasting inflammatory response.22 Much more research is needed to determine how neuroinflammation occurs; how it affects brain function at the molecular, cellular, and circuit levels; and how the brain and peripheral immune systems communicate. Nonetheless, this is a promising avenue of research with the potential to enhance our understanding of alcohol use disorder and other alcohol-related conditions. Alcohol’s effects on the immune system have important implications for treating critically ill patients with a history of alcohol use disorder. Such patients are more likely to require hospitalization, have longer hospital stays, or need treatment in an intensive care unit. They also are more likely to die from their illnesses.23–26 In addition, these patients are at increased risk of numerous complications, such as persistent fever, pneumonia, blood infections, ARDS, or confusion and disorientation. Finally, they may need higher doses of certain medications to achieve effective treatment.26 Treating patients who drink excessively for serious medical problems is, therefore, particularly challenging. Physicians need to be aware of a patient’s alcohol use to be able to offer the best treatment and to prevent more serious or even fatal complications. Considerable progress has been made in bringing to light the relationship between alcohol and the immune system. However, the immune system is exceedingly complex, and there still are many gaps in our understanding of just how alcohol affects immunity and, ultimately, health. Scientists are working to better define the ways in which alcohol interacts with and hampers the immune system. The knowledge gained from this research is expected to lead to new ways of preventing and treating alcohol-related illnesses, enabling physicians to bolster weakened immune responses and tailor treatment to the unique needs of patients with alcohol use disorder. 15 National Institute of Allergy and Infectious Diseases. Overview: What Are HIV and AIDS? April 3, 2012. https://www.niaid.nih.gov/topics/hivaids/understanding/Pages/whatAreHIVAIDS.aspx. 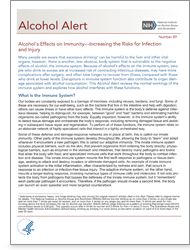 Source material for this Alcohol Alert originally appeared in Alcohol Research: Current Reviews, Volume 37, Number 2, “Alcohol and the Immune System.” Edited by Dipak Sarkar, Ph.D., D.Phil. ; M. Katherine Jung, Ph.D.; and H. Joe Wang, Ph.D.
Alcohol can either activate or suppress the immune system depending on, for example, how much is consumed and how concentrated it is in the various tissues and organs. That dual action predisposes heavy drinkers both to increased infection and to chronic inflammation. This issue of Alcohol Research: Current Reviews details how alcohol affects the immune system and how researchers are harnessing this knowledge to help prevent and treat alcohol-related harm. All material contained in these publications is in the public domain and may be used or reproduced without permission from NIAAA. Citation of the source is appreciated. Copies of the Alcohol Alert are available free of charge from the National Institute on Alcohol Abuse and Alcoholism, Publications Distribution Center, P.O. Box 10686, Rockville, MD 20849–0686. Or call 888–MY–NIAAA (888–696–4222).